Sailing a FW board is like sailing a slalom board. This isn’t surprising because that’s how it all started. Ten years ago, the current trend toward ultra wide boards was just beginning and a wide course slalom board was just under 24” wide, narrow compared to the 40“ width of current FW boards. 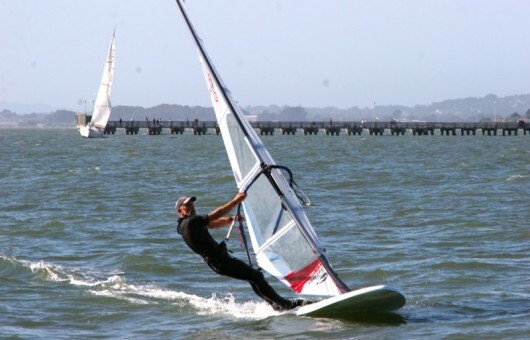 The only real difference between a slalom board and a FW board is that the FW board is stable enough to accommodate a larger fin and sail but the sailing technique remains the same. Reaching is the game either upwind or downwind. As you generate either positive or negative angle from a beam reach, your overall speed will decrease. The trick is to find the optimal trade off between speed and angle for your body size and sailing style. Generally taller, heavier sailors go for more speed than angle and shorter, lighter sailors go for more angle than speed. To really work on the basics, it helps to have a sailing partner to experiment with. Find out what happens when you increase your angle. As you sail higher (upwind) or lower (downwind) at slower speeds, did you gain or lose at the tack or jibe points? After a while, you’ll begin to get a sense of what that optimal speed vs angle is that will carry you to your upwind or downwind destination the quickest. Sailing upwind in gusty conditions takes concentration and anticipation. The goal is to try to keep your kit sailing at the most efficient combination of angle and speed while dealing with the variance in direction and intensity of wind pressure. There has been a lot written about how gusts head you or lift you depending whether you’re in the Northern or Southern Hemisphere. I won’t go into that more than to say in the Northern Hemisphere the gusts tend to head you on starboard tack and lift you on port tack. In the Southern Hemisphere it’s the opposite, port tack gets headed and starboard gets lifted. Keeping that in mind, when you’re on port tack in San Francisco Bay, the gusts will tend to speed you up and on starboard tack, they tend to slow you down. As soon as you can see or feel a pressure change, you should be ready or beginning to alter your course slightly. On port, as you feel the pressure build and your speed increase, head up slightly. On starboard, as you feel your speed decrease as the pressure increases, head off slightly. The idea is to try to maintain that optimal speed vs angle. Then as the pressure begins to decrease with the passing of the gust, your speed will begin to change again so start to make the appropriate course changes to bring you back to your optimal speed vs angle. Your ability to anticipate and make these changes as smoothly as possible in concert with the gusts will translate to better performance throughout the course. Since I do most of my sailing in the Northern hemisphere, the most common thing I see sailors do in gusty conditions is foot off on port and slow down on starboard. In the last tip, I talked about speed vs angle. There is a sailing term used to describe this, it’s called Velocity Made Good or VMG. The term takes into account any variable, wind strength, direction, current, etc. that can affect your speed and angle toward a distant point on the water. Essentially it’s a measure of how efficiently you’re traveling over the bottom of the body of water toward some fixed point on the horizon. So from now on, I’ll refer to the optimal speed vs angle and the optimal VMG. Your ability to minimize the time spent in areas of decreased wind pressure or lulls on a race course will improve your overall performance. It really helps if you can anticipate that your are coming into a lull. Often it can be seen on the surface of the water as a smooth area. If there are sailors ahead of you sometimes you’ll see them slow down or change angle. If the lull is large enough with a significant drop in pressure, you might consider tacking to try and avoid it. But often it’s a just temporary decrease in pressure that you’ll want to pass through as quickly as possible. So when you’re driving upwind and you see evidence on the water that you’re coming to a lull or begin to feel the pressure in the sail begin to drop, be ready to counter the resulting drop in speed by footing off slightly. This keeps the air moving across the sail attached and generating lift while also minimizing the amount of time spent in the lull, getting you to the good pressure again so you can resume your optimal VMG. 4) Upwind techniques in choppy conditions – reading the water and going over chop. One of the most difficult things to do on a FW kit is to try and maintain optimal VMG in very choppy conditions. Heavy chop is usually accompanied by strong wind and that means you’ll probably be running one of the smaller sails in you kit. In those conditions, you may want to move the mast base further forward on the board – maybe an inch or so – to give you a little more control over the nose. In any case, it’s hard to keep the front of the board from flying off to leeward and keep the fin attached to the water as you come off the crests. If the chop is large and steep enough, you’ll have to slow down and sail a higher than optimal course or risk getting totally airborne leaving the peaks. There may be other approaches to dealing with big chop, but I try to maintain as much of my optimal VMG speed as I can, anticipating how much my legs can adsorb the peaks and troughs of the chop while keeping the board on the water. I’ll do what is sometimes called ‘pre-jumping’ or unweighting the board before reaching a peak and pushing down with my legs as I pass over the top. I try to look ahead and ‘read’ the chop so I can slow down or speed up trying to work my way around or over the largest pieces. I’m always looking past the peaks for the flatter water in between sections of chop where I can take advantage of calmer water to speed up again. As with all these techniques, the fewer mistakes made and the closer to the optimal VMG that is maintained will be the fastest. Driving a FW board downwind in gusty conditions is can be one of the most challenging you can do on a sailboard. In extreme conditions, downwind speeds of over 30 mph can be reached. If it’s gusty in those kind of conditions, the edge of maintaining control and not getting launched vs. driving the deepest angle can be explored, but it will require one’s full attention. In regards to an to an overall good downwind VMG, knowing when to exploit a gust for a deeper angle and being able to anticipate the end of the increased pressure is key. Keep in mind there will undoubtedly be some shift in direction of the wind both at the beginning and end of the gust for the reasons I discussed earlier. So when coming to the end of a gust, it’s possible there can be an additive effect of a decrease in pressure and wind direction change that can easily stall the sail. What you don’t want to do is lose flow attachment toward the end of the gust because aside from slowing down, it will require a radical course change to windward, to reattach flow and get the board driving again. The idea is to feel the pressure increase and drive the board deeper, but watching and always being ready, possibly testing with minor course changes to windward, feeling for the end of the gust. It’s far better to come up a little bit with speed toward the end of the gust than to slow down and perhaps stall by holding too deep an angle for too long. You can always use that speed to drive the board off again. Also, I really try to avoid getting launched going downwind. So if I’m feeling uncomfortable with the intensity of the gusts and I think the chances of getting pulled over the front of the board are becoming too great, I’ll sail unhooked if necessary to avoid that situation. In areas of decreased pressure or lulls, again the main focus is to spend as little time as possible in them. When going downwind and encountering a lull, you’ll want to alter your course and come up to keep flow over the sail and avoid its stalling. Again, just like encountering a lull upwind, look for telltale signs on the water by keeping an eye over your windward shoulder to see where pressure seems to be. If the lull is large enough, you might want to consider jibing off while there is still pressure to get going again. Jibing in the middle of a lull and to have to stand waiting for enough pressure to return to get going again is something you want to avoid. Driving downwind in extreme conditions is almost always accompanied by large chop. Often you’re overpowered and keeping the board on the water becomes the biggest challenge as once the tail of the board loses contact with the water, you can lose the lift and directional control of the fin. In these extreme conditions, I like to get my rear foot more toward the center of the board and I use what is commonly called a center or ‘chicken’ strap. Bigger and more skilled sailors can often stay in the outside straps much longer, but if conditions become radical enough, I have yet to see a sailor who hasn’t been able to improve his or her downwind performance by the use of a center strap. First, it stabilizes the board so if and when it completely loses contact with the water, you can keep it going straight. Second, it changes your position relative to the sail, bringing you closer to it and effectively lengthening your harness lines. It also takes less body movement to sheet the sail in and out so it makes that part of control less sensitive. To that end, I’ll also physically lengthen my harness lines if conditions become extreme enough, just to give myself more room before I get pulled over the front of the board. The downside of using a center strap is that you don’t have as much leverage to power up the sail as you do when you’re in the outside strap, but when conditions are extreme, I’m usually looking for less or more controllable power, not more. Also, as you drop down the backside of a large piece of chop, if the chop is steep and close enough together, there is the possibility of the nose of the board penetrating the backside of the next piece of chop rather than riding up over it. As the nose of the board reached the bottom of the trough and begins it’s journey up the backside of the next piece of chop, it begins to slow down and the natural tendency is for your weight and the sail to be thrown forward. So it’s important to anticipate that happening and to keep your weight and the sail back because if you do, very often even if the board doesn’t completely ride over the next piece of chop, it won’t bury itself so completely that it stops and you keep going without it. One thing that I haven’t talked much about is safety. Though windsurfing is one of the safest sports around, especially considering the speed one’s body can attain, it still has dangers that sailors should be aware of. Probably the most dangerous thing you can do on a windsurfer is close with another windsrufer coming from the opposite direction on a collision course. If it’s windy, the closing speed can easily be over 60 mph. Most collisions can be avoided but the ones that aren’t usually happen when one sailor mirrors each avoidance movement made by the other. I call it ‘the dance’ and sometimes the only way to break out of ‘the dance’ is for one of the participants to stop making avoidance maneuvers. Technically it should be made by the person sailing on starboard tack, but the earlier the dance can be called off by either sailor, the better. Another windsurfing danger is the sailor becoming separated from the board. The most obvious way for this to happen is if the board somehow becomes disconnected from the sail and is blown away by the wind faster than you can swim. Another way it happens is when it’s windy and you fall ending up some distance from the board. If a sail has cambers and ends up draft down with the clew into the wind, it can hold enough of the mast and leading edge of the sail above the water and in the wind to propel the board and sail downwind, again faster than you can swim. In either case, you’re left stranded with no flotation. I’ve had it happen both ways and it’s pretty scary. The most important thing to remember is to try to stay with the board at all costs. Also it’s a great reason not to sail alone or if you do, carry some sort of communication device that can be used while in the water. I’ve known windsurfers to carry signal flares and also a length of extra line somewhere on your harness can sometimes help temporarily fix breakdowns enough to get you back to shore. 9) Looking as far ahead as you can rather than focusing on what’s right in front of you. A technique used motor sports were one wants to maximize speed over a course or uneven terrain is to drive as far ahead as you can. A fast driver is looking and thinking at least two or three corners ahead and anticipating the upcoming road well in advance of it’s arrival. The same technique applies to racing windsurfers. The further you look and sail ahead of where you are, the faster you’ll go as you’ll be setting yourself up for what is ahead rather than just reacting to what’s directly in front of you. Sometimes I get almost mesmerized by the water coming up right in front of me and have to force myself to look well beyond. When I do, I can almost feel my speed increase. It’s as if I’ve already taken care of what’s immediate and no longer have to give it much attention. Because my main focus is on where I’m looking, I’m instinctively setting myself up for what’s coming . The gusts, the lulls, the chop, the course, other sailors – all the things I’ve been talking about – they’re anticipated and processed before they arrive and I pass by them. And the result is that it’s much easier to keep the kit driving at that optimal VMG. It’s important to experiment with mast track position on a FW board. Every board is different and I’ve found where the mast is placed can sometimes make a big difference in feel and performance. In trying to standardize measurement of mast track position between boards, I use the convention of measuring the distance between the center of the universal attachment and the center of the front fin screw. I think those two points on a board provides the most meaningful way to compare mast track measurements between with other boards and sailors. Applying that convention, I know from experience that for me, somewhere around 45 inches is a good place to start. That will vary some for each sailor because of body size, boom height and sail design. As I test, I’ll move the sail backward or forward in ½ inch increments depending if the board feels dead and stuck on the water or if I’m having trouble keeping the nose down and the board tracking in a level attitude. Once I’ve found what I think is the best compromise for the sail size I’m using, I’ll note the mast position (I keep a notebook of these numbers and mark the position on the board). Then as I use different sail sizes, I’ll experiment moving the mast further forward or aft, again usually by ½” increments. The general rule of thumb is that the bigger the sail, the further back it is positioned on the board. Bigger sails weigh more and tend to settle the nose of the board and are often sailed with larger fins which have the same effect. Smaller sails weigh less and especially when combined with smaller fins tend to unsettle the nose of the board so moving the mast forward will counteract that trend. Boom height is very personal thing. I’ve seen top racers with boom as high as above their eyes and as low as just below their chin. There are a few things to consider when selecting a boom position. First, the higher the boom is on the mast the stiffer the mast will feel. Second, the further forward the mast position on the board the higher the boom can be carried comfortably. For me personally, I like the boom at least at eye level. It seems that with the boom that high I attain my best VMG up wind. What that is due to, I’m not sure. It may have something to do with the leverage I gain over the rig in addition to making the mast a bit stiffer. This setup works best when I’m reasonably powered with my harness lines at their shortest length. The fact that I tend to sail with the rig slightly canted to windward when I’m really powered may also affect how high I like my boom. I like the feeling of the board being lifted, up on the fin, feeling light and sailing fast. In light winds, I’ll sail the rig more straight up with longer harness lines and a slightly lower boom. There are other things that happen when you raise the boom. If the mast position is back far enough, it will make your front foot difficult to keep in the footstrap. When my boom is high and my mast is back on the board, I have to twist my foot to try to lock it in the front footstrap so it won’t pull out. Also, with the front foot being light, most of the pressure of the rig is concentrated on the back of the board through your rear leg and foot and depending on the placement of the rear footstraps, directly in line with the fin. This tends to lighten up the front of the board and give you a better feel of what the fin is doing. Another thing that happens is that you’re more vulnerable to getting launched on the downwind runs. So my advice is that if you want to try raising your boom height, do it in small increments over a period of time and see if your performance is improved, especially in more wind. That way you’ll give yourself a chance to get used to it, to see if it’s working and worth the effort. 12) Kit tuning – Harness line position and length. Perhaps one of the most overlooked adjustments of a FW kit is the harness line length and position. I’ve come back from events where I’ve inadvertently changed my harness line position on the booms because I’ve used the boom on a different sail and gone out sailing forgetting that I’d changed the harness line position, sometimes only very slightly. I’ve wondered what was wrong because nothing about the setup felt balanced or comfortable and I finally realize that it’s the harness lines that weren’t tuned. The same goes for sailing other sailor’s rigs. Even if I adjust the boom height, I almost never feel comfortable because their harness line setup is never identical to mine. I have three FW sails, a boom for each sail and I’ll spend time experimenting with harness line positions for each sail. Once I’ve found a comfortable setup that I feel maximizes performance, I’ll leave the harness lines pretty much at that setting for the season. I tend to sail with shorter harness lines than most people as I like to have the sail canted slightly to windward when I’m powered. I also like to have the lines positioned on the booms very slightly aft of the balance point so if I let go of the booms, the mast will tend to move forward and away from me. Since I have an inclination to pinch anyway, this sets the rig up with a tendency to keep the kit heading slightly off rather than coming up and possibly stalling, which I think provides for a better VMG. Sometimes when the wind is light and I’m going to be sailing a lot with not much outhaul and a draft forward sail, I’ll move the lines slightly forward. But most of the time I’ll just deal with a little bit of extra pull on the front hand. I also use adjustable lines. Again if it is very light and I want the sail more vertical, I’ll extend the lines. The same goes for going off the wind when it’s really windy. I’ll want to move the sail further away from my body to give me a little more insurance against getting launched. I’ve found that the smallest sail you can use that still generates enough power to keep you moving downwind at a good VMG is the best choice. Often before a race, I’ll go out and test conditions to see if the sail I’m thinking about is close to the right size. I’ll go upwind for a bit and if that feels good, I’ll turn off and go downwind. If I’m still reasonably powered and think the conditions for the race aren’t likely change, I’ll stay with that size. If I’m feeling over powered or under powered off the breeze and again don’t think the wind will change appreciably I’ll get on a smaller or larger size respectively. But since I’m not a heavy person (I’m around 155 lbs.) when I make the final choice of a sail for a race, I tend to stay with the smallest sail I think I can get away with on the downwind runs. If I can be efficient and keep a smaller sail powered, there are a number of things I can take advantage of. A smaller sail is easier to handle – it will faster through the transitions. It’s lighter and will make the board feel more lively, especially if I can use a smaller fin in the board. It also has less drag as it moves through the air so its top end speed is greater. And all things equal, a smaller sail, if it’s powered, has the opportunity to generate a better upwind angle. The downside is that it requires more consistent airflow over it to generate the same power that a larger sail can in the same conditions and it won’t be as easy to keep planing through holes. I think the trick to making a smaller sail work is to keep it moving so you have to be more careful about stalling it both upwind and downwind. Even if you aren’t quite as fast as you might be on the downwind runs with a larger sail, often you can make up more than the difference in upwind angle, speed and transitions. I’ve done quite a bit of fin testing and I’m convinced that selection of fin size is very similar to selection of sail size. 70 cm fins have more drag than shorter fins and tend to make the nose of the board feel like it’s settled on the water. And they can be much more difficult to control downwind. So again since I’m on the light side of the average FW sailor, I tend to choose the shortest fin I think I can get away with on the upwind legs of a race. With a medium powered 9.0 and long upwind legs, I’ll run a 67 cm fin. If it’s really powered, I’ll drop down to a 64 cm fin. If it’s overpowered, I’ll go even shorter to 61cm. In these situations, I’ll move the mast track forward, sometimes to over 56 inches, because the board is going to be really lively with a light sail and shorter fin. The biggest problem for me is that on the downwind runs, if I’m overpowered and the water state is rough, I have trouble keeping the board running deep if I use longer fins. Upwind, in overpowered conditions I can usually handle longer fins but I find I can really drive the board much harder with the smaller ones because I’m not afraid to bear off slightly to pick up speed and turn it back into angle. Again the key is to keep good flow over the foils and avoid stalling. Once a smaller fin has flow going over it, it can easily generate similar lift to a larger fin traveling slower and even if the angle of the smaller fin isn’t quite as great as the larger one, often the increased speed and ‘driveability’ is more than enough to generate a better VMG. And when you get to the downwind run, the smaller fin will be faster and way more fun! 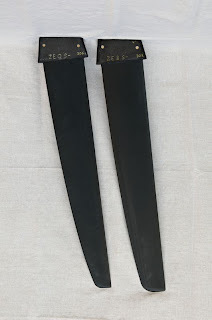 The fin can be an important part of the ‘suspension’ system of the board. Since I’m only 155 lbs, I like fins on the softer end of the stiffness range. They tend to be easier on my legs and provide more feedback for what’s going on underneath the water. With a softer fin you can feel it bend without it losing attachment with the water. It gives you warning that it’s close to losing attachment (commonly known as spinout). This feedback also allows you to get and hold the board ‘up on the fin’ in a more controllable fashion. Hard fins don’t give much feedback before they completely detach from the water. When it comes to lifting the board and generating windward angle, a softer fin allows me to use it like a spring. I can load it and release some of it’s energy to drive the board slightly higher. It’s similar to using the sail to finish off each gust of wind by driving a little harder and faster to windward. The downside of this is that the loading and lifting can become too aggressive, especially in very gusty conditions. As a result, the fin can lift the board completely out of the water and you end up riding only on the fin, fighting for control. Getting lifted that way is not exactly fast sailing. It usually takes a decrease in speed to bring the board back down onto the water and under control – if you can. The rake of a fin is the angle at which the overall thickest part of the section is to the bottom of the board. Less rake means the fin is more upright, more rake means the tip fin is tilted more toward the tail of the board. When you combine fin size and stiffness with rake, you have 3 parameters with which to tune a fin. Generally, the same fin with less rake will generate more lift. If the fin is soft, less rake will make it feel like it has more drive. The downside of less rake is that it will make the fin more difficult to handle when conditions pick up. I’m looking for in a fin that I can controllably lift the board with and when combined with the size and stiffness, the rake angle of a fin can be very important. By experimentation with size, stiffness and rake, you can get an idea of what works best with your body weight, board design and sailing style. There are 4 things you can use to tune a FW sail – mast selection, downhaul, outhaul and batten tension. In this tip I’ll talk about mast selection and how it affects the tuning of a race sail. I won’t go into the flex characteristics of the different masts on the market but for the most part, race sails are designed to work with a specific mast. A sail designer selects a mast or has one built that has the flex characteristics he thinks will optimize the handling and performance of his sail design and then tunes the design to the mast. Since different brands and types of masts vary considerably in their flex characteristics it’s important to try to match the sail with the recommended mast. Masts vary not just in overall length and stiffness denoted by the IMCS numbers but also in how they bend both statically and dynamically. Using a stiffer mast than recommended in a race sail will give the feeling of sailing a big sheet of plywood. The sail will be stiff and reluctant to pump well or breathe. Using too soft a mast can make the sail feel overly soft and spongy. Though it might be OK for the lightest conditions, the sail probably won’t perform well through the wind range that it was designed for. It’s also important to note that within masts of the same brand and design, there are subtle differences that can affect the performance of a sail. There are ways to measure the static bend characteristics of masts and sometimes that data will give you an idea of how a particular mast might optimize the performance of a sail. But the only way to really make a performance evaluation is by putting the mast in a sail and testing it on the water. On most racing sails there is an optimal range of downhaul tension. Too much downhaul tension makes the sail feel less powerful, slow to accelerate and not able to attain a good an upwind angle. Too little tension can make the sail feel unresponsive, draggy and reduce its top end speed. It can also make it hard to handle and require excessive outhaul when conditions pick up. Most race sail manufacturers give a range of luff length (the luff sleeve length from the top of the sail to the bottom or tack) the sail is expected to need. That will give some indication of how much extension is necessary to achieve a proper downhaul setting. A common way of measuring the amount of downhaul a sail has is by watching how far the looseness of the leech (back of the sail) migrates toward the luff (front of the sail). Some manufacturers put a mark on the sail where the looseness or wrinkle migrating from the leech should reach with the optimal amount of downhaul tension. The looseness of the leech is proportional to the amount to twist the sail will exhibit. For a given sail, more twist usually means better top end speed and better handling in high wind and less twist means more low end power and better upwind angle. I watch the migration of the wrinkle and the fall off of the leech. I prefer to see even and progressive leech fall off from the clew to the head and a wrinkle migration to at least 2/3rds the way to the luff. Once you’ve decided on the amount of downhaul to try, test the sail paying attention to how it feels and it’s performance. If it doesn’t feel slippery enough and seems like it’s stuck in first gear and won’t freely accelerate in the puffs, you may want to try more downhaul to loosen the leech and give the sail more twist allowing it to ‘breath’. If it feels like it has good top end but won’t generate the windward angle and needs more power in the lulls, try less downhaul. See if the midrange improves without sacraficing too much of the top end speed. Experiment with different downhaul settings – maybe 1/8 inch more or less at a time. Tune the sail for your sailing style – a slightly tighter leech for grinding and pinching at slower speeds (more bottom end power but generating less apparent wind) or a looser leech for footing with speed (better top end power as the sail can ‘breath’ using the generated apparent wind). Using an adjustable outhaul is the easiest way to increase the range of a sail because it’s relatively simple to set up and use while sailing. I use an adjustable outhaul on any rig, even wave sails. I can increase the power and range of a sail to almost one size larger and depower it to one size smaller by just by adjusting the outhaul. Obviously you can do the same thing by stopping and making the adjustment, but when the wind picks up during a race or you’re watching that next wave that you need to get over coming at you, the effect of being able to decrease or increase the power of your sail instantaneously is invaluable. With a race sail, the outhaul adjustment is very important because along with increasing the range of the sail, it affects both the handling and performance. Assuming you have an optimal downhaul adjustment pretty much figured out, the power a sail generates can be further adjusted with the outhaul. Starting with neutral outhaul tension, flattening the sail as the wind picks up will increase its upwind speed and reduce backhand pressure. Driving up wind, it makes the sail easier to handle and the board less likely to lift off the water in the gusts. On the down wind runs, if you let the outhaul off and bag the sail, you can feel the power increase along with your speed and downwind angle. Aside from increasing the power of the sail, letting off on the outhaul allows the sail to become more round, especially near the leading edge, giving it a wider range of angle of attack. That makes the sail less likely to stall and much more forgiving in gusts. To find the limits of how much outhaul adjustment the sail can use, again it really helps to have a training partner or a recording GPS. For a given wind strength, over outhauling the sail makes it too flat. It feels underpowered. It also decreases your windward angle. Under outhauling the sail makes the sail feel powerful but draggy, not slippery or fast. Another side effect of an under outhauled sail is that upwind it can make the fin feel tender and easily pushed sideways. It’s important to get used to how much outhaul a sail needs in different wind strengths. Since that setting changes, sail performance can be significantly enhanced by knowing where the optimal outhaul setting is and keeping it properly adjusted. Continually experiment with the outhaul – it’ll surprise you how much difference it makes. One of the most overlooked areas of improvement in overall performance on a race course is in transitions. I know a number of sailors that are extremely fast with good angle once they are underway and driving either upwind or downwind but overall they are not all that fast on a race course. It’s because they are slower tacking or jibing and getting up to speed again. This is true of any kind of sailboat racing but especially critical when racing a FW board. A FW board can travel at over 15 mph upwind and over 30 mph downwind. That means that every extra second taken during a transition and getting up to speed again equates to over 22 feet in distance lost going upwind and over 44 feet downwind. A couple of extra seconds on every transition will negate any gain made with blazing board speed or killer angle. Two or three tacks with an extra second and you’re 66 feet behind. An extra second on 3 jibes and you’re 132 feet behind. Even just bobbling a tack or jibe can put your competitor substantially in the lead. That’s why if you attend a racing clinic given by one of the pros, transitions will be a main topic as it’s critical to overall performance to spend as little as time as possible in transition.